Does inequality prevent economic growth? As part of an event celebrating the National Employment Law Project, I participated in a panel moderated by Bob Herbert, former oped writer for the NYT (an extremely compelling one at that, whose themes were race, poverty, inequality, and justice) and now a senior fellow at Demos (the other panelists were Dorian Warren and Lynn Rhinehart). The question of the impact of inequality on growth came up and that made me want to work out my thoughts on that relationship. These issues are very usefully addressed in this recent paper by Boushey and Hersh (more on that below; see their page 8 for a short summary of the ineq/growth lit), but here, in an extended post, are some of my thoughts about it. The classic theory on how growth affects inequality maintains that there’s an inverted U-shaped relationship over long periods of economic development. As emerging economies grow they initially become less equal as the few with high financial endowments profit off of their ownership of key productive resources, like land. Then, as industrialization evolves, much more of the population has the chance to participate in higher value-added work which reduces inequality. Note that in this argument, as in my own on this topic, causality goes from growth to inequality, i.e., the latter is the dependent variable. I’ve stressed the important and inequality-reducing impact that full employment—itself a function of growth—has on the earnings and incomes of middle and low-income households. But lately, more people have been arguing the other way, suggesting growth is a declining function of inequality. This turns the causality around, and now growth is the dependent variable (it is “endogenous” to inequality). So, where’s the evidence for causality flowing it that direction? This is a gnarly question indeed, as both growth and its distribution have so many moving parts. Untangling them is a daunting measurement challenge. But you know my methods, Watson. We start with the means, as it were, just plotting one against the other, testing correlations, leads and lags, etc. If there’s not much there, it doesn’t mean further search is fruitless, but it often implies the search will be challenging. 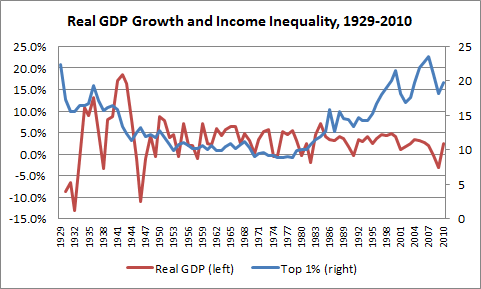 The figure below plots yearly real GDP growth and the share of income going to the top 1%, 1929-2010. The long inequality series follows a U (as opposed to an inverted U), as broadly speaking, post New Deal reforms and institutions (collective bargaining, minimum wages, safety net, social insurance), spreading industrialization, full employment job markets, and less globalization all led to more broadly shared growth until the 1970s. Since then, inequality has trended up, with large cyclical movements in recent decades (these data include capital gains and losses, which are both highly cyclical and play a significant role in movements of the income share of the top 1%). GDP growth used to be a lot more volatile but besides that, it doesn’t match up with inequality in any obvious way. If you squint at the end of the series, you might see a negative correlation, as inequality takes off and growth rates trend down some. But I ran a bunch of correlations, with leads and lags and moving averages, against the levels and changes in the top 1% share, and didn’t find anything to speak of. I’ll post the series if folks want to fool around with the data. But this is way too crude. When you’re dealing with relationships between complex variables in economics, it helps to have a simplifying model. So here’s some thinking about potential relations that could make faster growth a function of less inequality, linkages that don’t show up at such a high level of aggregation as in the figure above but might be deep in the data once we take a closer look. –More equal distributions generate more robust demand throughout the economy, which in turn leads to more broad-based investment and more growth. Imagine an economy with two consumers and one investor. With high inequality, consumer Richie gets all the growth, buys a bunch of cars, some fancy watches, etc. With low inequality (but similar growth), consumer Poe now has enough money to buy a cheap car and a Timex, but Richie still buys a few cars and a watch or two. In scenario one, the investor doesn’t see enough demand to expand production, say, to build a new line of mid-range products. In scenario two, she does, which leads to more growth than would otherwise prevail, and does so as a function of more the broadly-based demand generated by a more equitable income distribution. Even if Richie can spend enough to offset the reduced consumption of Poe, it is generally thought that Poe’s marginal dollar is more likely to be spent than Richie’s (Poe’s “marginal propensity to consume”>Ritchie’s). That’s why, in the context of stimulus discussion, we emphasize that mulitpliers are higher for tax cuts targeted at middle-income rather than high-income households. Our GDP is still 70% consumer spending, so more balanced growth should drive greater consumption and, again, more demand. This applies more in an economy with output gaps and underemployment, but unfortunately, that’s been the norm of late. This is the growth model envisioned by Nick Hanauer as described here. I’ve always thought it made a lot of sense, but I’m not sure. For one, while Nick correctly points out that he and his fellow 1%’ers can only buy so many cars, I’ve seen some evidence that, in fact, very wealthy households can spend enough to generate a lot of demand. –High inequality leads to under-investment in the productive skills and well-being of those hurt by inequality, leading to lower potential growth levels. As Boushey and Hersh convincingly argue here, with high levels of inequality, we will underinvest in human capital (and perhaps physical capital, i.e., public goods/infrastructure—discussed in the next two models) and that will reduce growth relative to a counterfactual wherein poor kids can achieve their intellectual and economic potential. Economist Joe Stiglitz has also made this argument for years. To the extent that inequality channels income away from large swaths of households, it blunts opportunity, raises poverty, and heightens the barriers to economic mobility. Surely, this has growth effects both in terms of the social and budget costs of poverty and the sacrifice of underdeveloped human capital, though here again, the empirical evidence has not, to my knowledge, been developed. My sense is that political economy models, like this one and the next one, may provide richer linkages between inequality and growth. The shampoo economy of the last few decades (bubble, bust, repeat) has arguably contributed to the lower growth rates, on average, toward the end of the figure above, especially when you average in the great recession. Some of the key factors contributing to higher inequality—financialization of industry, deregulation of financial markets, favorable tax treatment of non-labor income, middle-income wage losses replaced by loose credit—are also key factors in the shampoo cycle, suggesting a potentially important causal chain. In a very highly developed thesis, Acemoglu and Robinson explore the linkages between inequality and devolution of political institutions that, in good times, stabilize and promote growth through many of the channels noted above (e.g., rule of law, proper oversight, adequate public investment). I’ve stressed my own mini-version of this in models like this one here, demonstrating linkages between increased wealth concentration, money in politics, and the ensuing “purchase” of a political agenda that blocks corrective policies. This in turn reinforces further income concentration leading to the same set of growth reduction problems noted above re the bubble/bust cycle and underinvestment. I’m as much a growth freak as any card-carrying economist, and it should be obvious that for all of our focus on inequality, robust growth is a necessary, if not sufficient, condition for the improved living standards of the broad population. But suppose, after exhaustive research on the causal chains suggested above, we found that growth wasn’t so much a function of inequality? Would that make the argument that poor kids should be able to realize their intellectual and economic potential any less compelling? Would it make the goal of full employment in the name of a more equitable distribution of productivity growth any less of a venerable goal?